figure 7.19 Cross section of Cycas revoluta leaf showing papilla (P) and sunken guard cells (arrows) (Extant). Bar = 50 pm. They suggested that a combination of cutin, waxes, and lipids from the interior of the plant may combine during diagenesis to form the so-called cuticle found on many fossils. figure 7.20 Glandular trichome on Coleus sp. epidermis (Extant). Bar = 50pm. along with other epidermal characteristics, have been used to classify fossil foliage in the cycadophytes (Chapter 16). The basic types of stomatal arrangements include: (1) anomocytic (irregular), in which subsidiary cells are lacking, that is, the cells around the guard cells are not distinguishable from other epidermal cells; (2) paracytic (parallel), in which elongated subsidiary cells flank the guard cells; (3) anisocytic (unequal), which has three subsidiary cells, with one substantially smaller than the other two; (4) actinocytic (ringlike), with a circle of subsidiary cells around the guard cells; and (5) dia-cytic (cross-celled), in which there are two subsidiary cells, and the wall that these two cells share is at right angles to the guard cells. There are many variations on these types and gradations between them; different types can even occur side by side on the same organ (Kothari and Shah, 1975). For further information on these and additional types, see Van Cotthem (1970), Leaf Architecture Working Group (1999), Beck (2005), Carpenter (2005), and Evert (2006). Stomata may be on level with the surface of the leaf or may be sunken, which is common in plants that live in arid environments. Guard cells are usually bean shaped and covered with cuticle. They allow for the controlled opening and closing of the stomatal pore through changes in turgor pressure within the cells. Guard cells are known to respond to various exogenous environmental stimuli, including light (especially UV-B radiation) and CO2 concentration. Certain plant hormones, especially abscisic acid, mediate the internal reactions and ionic changes that control stomatal opening and closing through guard cell water potentials. 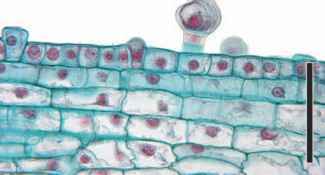 Certain epidermal cells produce outgrowths (FIG. 7.20) which develop into trichomes (hairs). Trichomes are common, especially on leaves, and have a variety of functions, including additional protection against water loss. Some of them are glandular and secrete substances that are important in deterring herbivory. They are known throughout the fossil record and range from multicellular glandular types (Krings et al., 2003a) to simple one-celled forms. 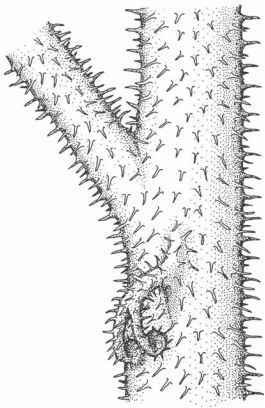 Trichome bases may be preserved on fossil leaf cuticles, even when the trichome itself is no longer present, and have been useful in paleoeco-logical studies. The type and arrangement of trichomes can also provide systematic information.